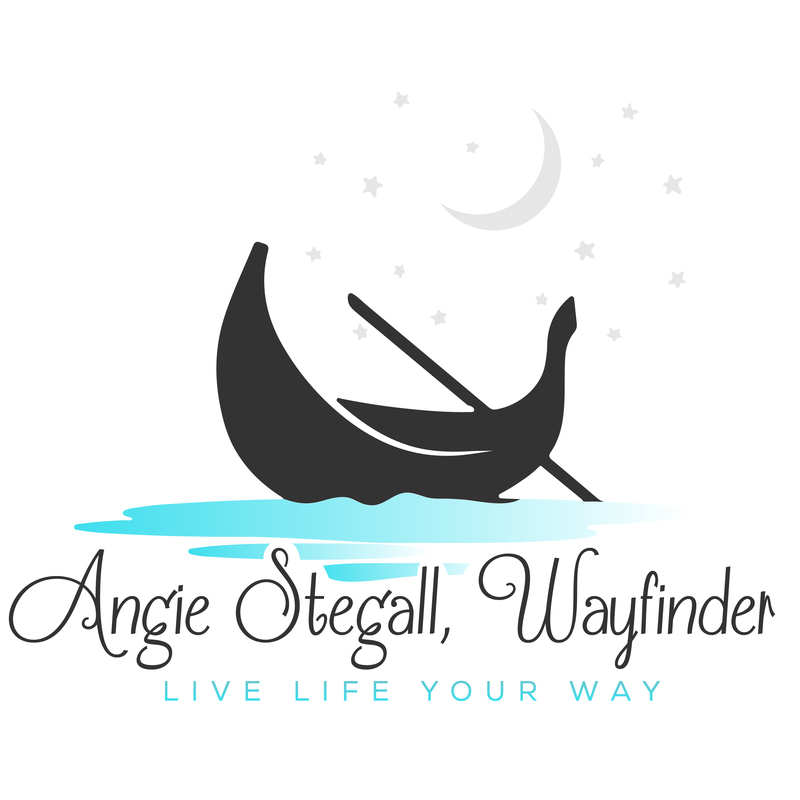 Angie Mattson Stegall is a Wayfinder (Business and Life Coach) and an award-winning author of five books. Wayfinding is the term Angie uses to describe the work she does with people – usually business owners, professionals, and millennials. Wayfinding is about inquiry, impact, and clarity. Angie can “see” where someone is stuck and excels at helping them unpack their confusion, move through the pain of indecision, and find the clarity they want to take aligned action with confidence and joy. In business since 2003, Angie shares her extensive business experience through seminars, teaching, and speaking (classes, breakouts, and keynotes). She’s spoken to groups at Blue Cross Blue Shield of NC, MassMutual Insurance, the Western Women’s Business Center’s Annual Conference, Duke Energy, FemCity, Sisters United, and eWomen. She’s worked with executives and their teams at Duke Energy, MassMutual, Doosan, Kuebler Inc., and Corning as well as with dozens of small business owners and their teams. Angie Mattson Stegall earned a BA in Organizational Communications from Queens University of Charlotte. She started Life Coach training through Martha Beck in 2018 in order to obtain certification, which she expects to receive in early 2019. Tools she uses on herself and with her clients include the Change Cycle, Body Compass, and Internal Family Systems. She coaches business owners, business professionals, and millennials. to help them create lives they love and to focus on work that supports those satisfying life choices. Angie won the 2014 Women’s Business Award (author category) at the fifth annual Women’s Business Conference and was a Founding Member of the Brevard Authors Guild. She also received the coveted 5 Star Award from in the 2016 Authors Talk About It independent book awards for her fourth book, Make Some Room: Powerful Life Lessons Inspired by an Epic 16 day Colorado River Rafting Trip through Grand Canyon. Personally, Angie and her husband Nelson live, work, and travel the country in a Class A motorhome with their black lab “Rex” and a big orange cat named “Hobbes.”. Angie and her husband live to travel and love immersive experiences, like taking a private 16-day Colorado River rafting trip through Grand Canyon and spending 11 days on a self-supported raft adventure covering all 149 miles of the French Broad River through NC and TN. In 2016 they completed a 6,000 mile road trip to see Glacier, Yellowstone, and the Badlands National Parks and Devil’s Tower National Monument. In 2017 they traveled 10,000 miles back and forth across the country to visit the Rocky Mountains, Zion National Park, Joshua Tree National Park, The Petrified Forest National Park, and the Civil Rights Museum in Birmingham, Alabama. They sincerely believe taking time away from their businesses regularly keeps them more engaged in every aspect of life. She’s been interviewed on numerous podcasts, including: “The Brave Entrepreneur” Podcast with Jena Rodriguez, “Plum Deluxe” Podcast with Andy Haynes, “Uncommon Wisdom” Podcast with Adrienne Craighead and Julie Tache, Authors Talk About It” Podcast with Rob and Janelle Alex, “The Art of Non-Conformity” with Chris Guillebeau, and “Speaking of Travel” with Marilyn Ball.